RCA introduced America's first consumer television receiver sets at the New York World's Fair in 1939. Picture tubes ranged in size from 5" to 12" and faced upward on top of the cabinet with a tilting mirror to view the picture horizontally. The illustration shown is a 12" Model TRK. All were designed by John Vassos, who established the first internal design department at RCA in 1933, and remained as a consultant until 1964. Vassos also designed the theme and concept of the RCA pavilion at the World's Fair, where in April, in a speech entitled "Birth of an Industry", RCA president David Sarnoff announced the first live television broadcasting of a news event --President Franklin Roosevelt addressing the crowd at the fair. Sarnoff predicted that television would one day become an important entertainment and information medium. Sarnoff soon publicly credited Vladimir K. Zworykin of RCA with the invention of television. Zworykin had just received a patent in 1938 for his iconoscope, a television camera with millions of tint photocells replicating the human eye. What Sarnoff did not reveal was that he was already paying royalties to the REAL inventor of television. The real inventor was Utah engineer Philo Taylor Farnsworth (1906-1971). In 1920, as a 14- year old high school student, Farnsworth conceived and described the electron-scanning process and by 1927 invented an electronic television image dissector (camera) tube and successfully transmitted a series of images far superior to current mechanical television systems (see below). He applied for a patent. In 1923 Vladimir K. Zworykin (1889-1982), a Russian immigrant then working for Westinghouse, filed a patent for a television camera, to scan a picture by entirely electronic means. He called it an iconoscope. Zworykin was hired by RCA in 1929 and given enormous resources to "invent around" the television patent applied for by Philo T. Farnsworth. RCA then challenged the Farnsworth patent application as an infringement of "similar work being done" by Zworykin for RCA. But Farnsworth's patent was granted in 1934, based on his earlier work as a student. That year, Farnsworth conducted the first public demonstration of his electronic television system at the Franklin Institute in Philadelphia. In 1936 Farnsworth transmitted electronic television experimentally from station W3XPF in Philadelphia. The few sets that were available could only "tune-in" to the single station for which the set was designed. 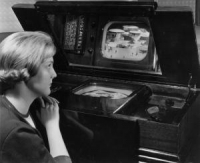 Also in 1936, The first television experimental broadcast field-tests were conducted by RCA in New York and Alexandra Palace, London using (already then outmoded) mechanical television. This had been developed by Englishman John Logie Baird, who in 1926 successfully demonstrated his "televisor", a mechanical system of television using spinning disks developed in the mid 1880s by German engineer Dr. Paul Nipkow. The flickering neon-pink image was transmitted several yards. Baird invented the system in 1924, and by 1928, was able to achieve crude color television. Charles Francis Jenkins developed another version of the mechanical system independently in the US, and in 1927 transmitted the first crude television images in the US from Washington to New York featuring Herbert Hoover. So by 1939, Farnsworth was receiving royalties for the use of his invention from RCA. But because RCA denied him public credit, Farnsworth remained virtually anonymous until after his death in 1971. The war delayed manufacture of consumer television sets until 1946, and it was not until 1950 that prices became reasonable. In 1954, when there were 26 million households with black & white television sets, RCA introduced the first consumer color sets, using a new tri-color picture tube, but reception was still unreliable. No others were on the market until 1959, when courts settled patent suits brought against RCA by Zenith and others. "It won't be very long before color television will be a mass item of commerce" said David Sarnoff, Board Chairman of RCA, in 1962. By 1964, 1 million sets had been sold, and by 1967 color outsold black & white sets. Those of you under the age of 40 probably know the rest of the story.